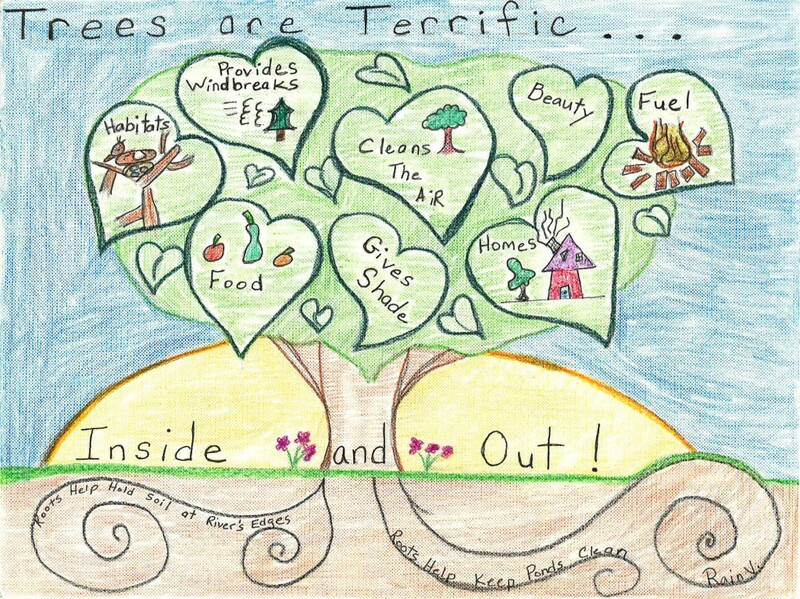 Rain Vasey, a Grade 4 student at Watergirl Farm Academy in Lincoln, is the statewide winner of the annual Arbor Day Poster Contest. The Delaware Forest Service sponsors an annual Arbor Day Poster Contest for Delaware school children in grades K-5. Poster contest information is published in January/February, with awards presented in April or May during our annual Arbor Day Ceremony. In addition, the Delaware Forest Service also distributes free pine seedlings annually to Delaware elementary school children on a first-come, first-served basis. The 2015 contest theme was “Trees are Terrific… Inside and Out” – designed to increase student knowledge about how the structural components of trees and how these components help a tree function. This lesson can be adapted for grades K to 5 and makes an excellent addition to units covered in science. The poster contest is an annual way for students to learn more about the role trees play in our communities and schoolyards. The Arbor Day Poster Contest also helps incorporate the importance of trees into classroom learning and help students foster an appreciation for the natural world around them. As always, the Delaware Forest Service also provides all participating classes with free loblolly pine seedlings. The contest is open to all Delaware students in grades K to 5. Public, private and home schools are encouraged to participate and posters are welcome from after school groups and youth organizations.